It seems possibly the most misunderstood aspect of 2.4GHz radios is how many can be used at one time and if that saturation point is met, what happens? The high-output portion of the band we use in 2.4GHz (as regulated by the FCC) is split up, somewhat arbitrarily by our systems (each company has their own way of dividing up the frequency band). So, indeed only about 39 DSM/DSSS aircraft systems can be in use at 1 time if Spektrum is the only radio in use. (see a link to Spektrum and a quote from their website at the bottom). If you mix all the different brands and their proprietary type of signal/system, generally, the total number of radios that can be on and function 100% reliable without slow down, etc. is about 36 for aircraft (surface gets more because when only surface systems are in use, Spektrum is only using 1 frequency at a time instead of 2). Now, that 36 number can vary, but in our practical testing, we’ve found it’s right around 36-39. At that point, the DSSS and DSM systems will no longer find a clear signal and the other brands start to slow down a little. What it means: EXCERSIZE frequency control at major events or busy flying fields! Is 2.4GHz better? SURE, OF COURSE!!!. If too many radios turn on, either they will not find a frequency and will not transmit or they will work but just with a little delay (thus you’ll see it and probably just turn off anyway) unlike 72MHz where if some one just “turns on” without concern, he can knock you out of the sky! So, 2.4GHz is GREAT but there are still limitations and you and your club/flying field might want to consider those limitations. What happens if the band is full (80 users for surface or 40 users for aircraft) and I turn on my transmitter? In the unlikely event that all channels are occupied, the next transmitter will scan the band indefinitely until open channels are available. The transmitter will then acquire the channel(s) and begin transmitting. Only then will the system connect. Spektrum, DSM, Horizon, are all products copyrighted by Horizon Hobby. I’m only mentioning them here to help create wider understanding of the hobby. DSSS, Airtronics, Sanwa, are all copyrighted by Sanwa Japana and used by Global Hobby with permission. Reasons why I Like Sanwa/Airtronics…. 1. When we tested the first RDS8000 2.4GHz test sample, their Executive Director and Senior Engineer were there, in person, in So CA, to work with me testing that radio. 2. They didn’t come until they had tested it themselves repeatedly. 4. They gave us MORE samples to test all over the country. When we found ways to improve it, they researched it, executed the improvements, and airshipped revised samples directly to our pilots. 5. Even though they were still on a deadline to get the radio produced, they delayed production for more testing when I just had a “concern”. 6. Their entire R&D staff put in extra hours to work to get the radio done. 7. They made it for a price that makes it a value. It’s not some overpriced piece of work. It’s got an aggressive price to make sure it’s competitive. 8. They didn’t get greedy on the Receiver but instead made it the most affordable 8 Channel 2.4GHz receiver on the market at 79.99 typical street price. They did this, in part, because our test pilots told them how important receiver pricing is. Is the RDS8000 perfect in all ways.. of course not… NO Product is…. There are always improvements to be made when you’re striving for perfection… Is it a great value and a super first step into 2.4GHz for Airtronics? Absolutely. The radio looks great, works great, feels great, and will serve Airtronics pilots well. 10. This is the most important….. THEY CARE. So, you may not buy an RDS8000 (too bad if you don’t, you’re missing out on a great, easy to use, sport radio!) but just know when you’re considering your next radio purchase or radio accessory purchase that Airtronics and Sanwa engineers care, they listen, and they’re dedicated to making great products. Having the RDS8000 finish it’s first production run on Christmas was an awesome Christmas gift for all of us at Global. We’re looking forward to this product and to many new radios, servos, and accessories from Airtronics in 2008! Russ Greaves and I took out the new Model Tech Mini Mach Racer and put it up for its maiden voyage. When we get prototypes we usually get ZERO documentation from the factory. So, we guessed on this one and got it wrong. The good news is, when it went totally out of control on launch, it was no where near anyone (we always launch well away from ANYONE, pilots included) so there was no danger. NO damage! Got lucky there. So, we moved the battery forward and this time, it flew right out of Russ’s hand, PERFECTO! Wee the fun we have with prototypes! Anyway, it was AWESOME. 80-90 MPH (based on the speed of the other planes and the speed of which other ‘known’ entities fly at) is my guess. Lands easy, launches easy, flies very fast, is stable in the entire speed range, and was simply a blast! This is a fun plane to fly. Now we’re waiting on a new sample with some creature comforts to make it easier to use for the pilot (removable fins and magnet attached canopy hatch so that the plane will easily go back into it’s box and the battery will be easily accessable). Anyway, cool plane, due in probably May. FIVE YO-YO STRINGS LA LA LA…. Hope your stocking is filled with killer-stuff that makes the hobby even more fun for you in 2008! -Enjoy the family, enjoy the kids, enjoy the season, and most of all, I wish you a happy and healthy 2008! 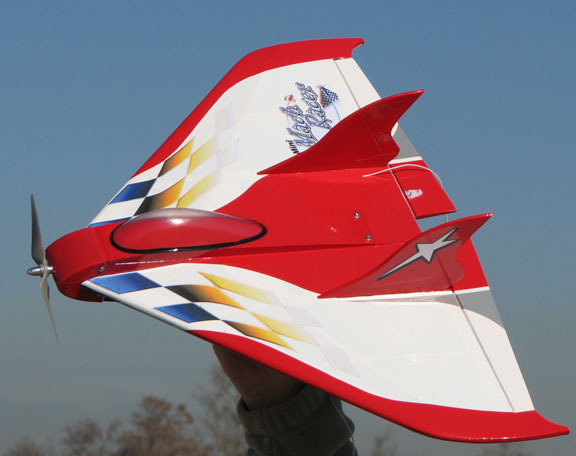 The BH Models Trojan 60 size ARF has a GREAT review online at ezonemag (RC Groups). It not only shows the plane but a fairly affordable conversion to electric power. Powerful electrics are becoming more attainable without exotic equipment. This article really shows how nice a big power system can be. One of my job duties that really makes my job not a job is test flying. Monday Russ and I went over to Fairview Park to do a little test flying. 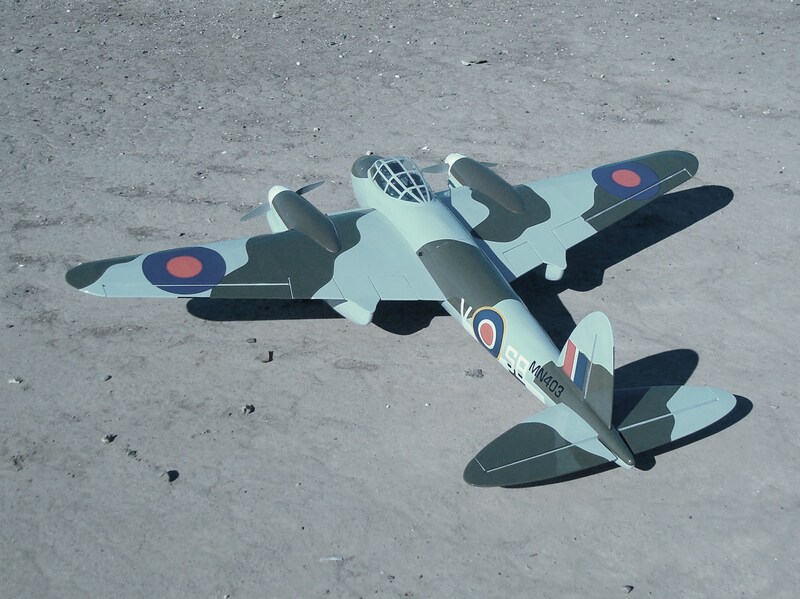 The highlight of the trip was test flying a prototype of the new BH Models twin electric DeHaviland Mosquito. What a cool plane! Power is a 4 cell (4s1P) 3200mAH (EDIT: I originall stated 40000 mAH…obviously that was wrong! Thanks Farrell!) y-d to two Casle Creations Thunderbird 36 Amp ESC’s and two 2814 KMS motors. We’re running 9×4 props which only pulls about 36 amps total static (18 amps per motor). These motors are rated to 25 amps continuous with no problem so we’re well under the max power we could put through the system. With that power system the plane takes off in 20-30 feet, flies along at a very good clip, can pull vertical for a little bit to make a very nice wing-over, stall turn, and square loop. 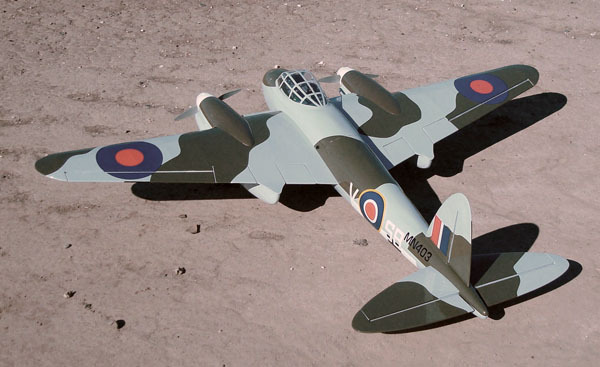 Not exactly scale aerobatics since the Mossie was really a bomber, but wow very very cool. These new BH Models are simply top-notch. The wing is 2 piece with an aluminum tube joiner, the canopy comes off with two thumb screws, and the nose is the hatch for the battery and this is held on with two self-locating magnets making battery access SUPER EASY. The cowls are all factory-fit, the canopy/tophatch has the window installed and detailed, and inside sits two factory painted pilots. Another cool feature is that the firewall bulkheads are moveable. This way the modeller can change the dept of the firewall to accomodate different length motors and mounts. We also flew two new Foamies. One is a Ready – t0 – Fly from WattAge called the Sea Vixen. The full scale Sea Vixen was a English twin boom jet. Our foamie is kinda’ stand-off scale, but it looks nice. Instead of a jet, ours uses a little pusher motor. The power system is a 3 cell lipo on a brushless motor which provides PLENTY of performance. This plane has a nice presence in the air, and since the whole thing bolts together, it’s quick and easy to assemble. Truly a RTF worthy of the name. 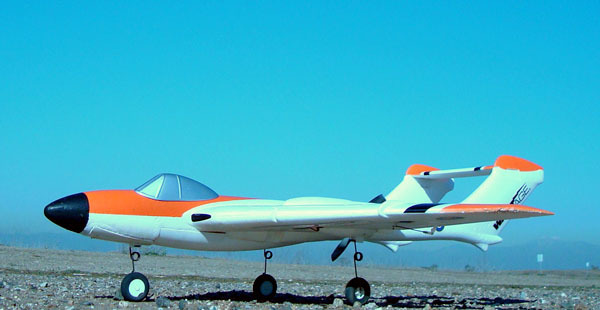 The final airplane we flew is a new model from Phase 3. It’s a Radio-Ready P-40. This model will be factory assembled with the brushless motor, 3 cell battery, servos, etc.. but will not come with a radio. Anyway, it was a great day of flying, makes me thankful I have such a cool job! (Yes I’m bragging).